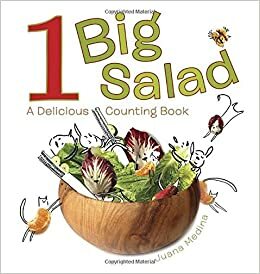 Summary: The numbers from 1 through 10 are explored with the ingredients of a salad. Each page has the numeral (1) and the word (one), along with an animal created from a fruit or vegetable. There’s one avocado deer with a big brown nose made from the pit, two radish mice, three pepper monkeys, and so forth. The produce has been photographed, then embellished with black line drawings to create the animals. One big delicious salad is shown at the end, with a recipe for dressing on the very last page. 32 pages; ages 3-7. Pros: The graphics jump off the page in this fun introduction to both numbers and healthy eating. Cons: Will preschoolers want to eat those cute tomato turtles?